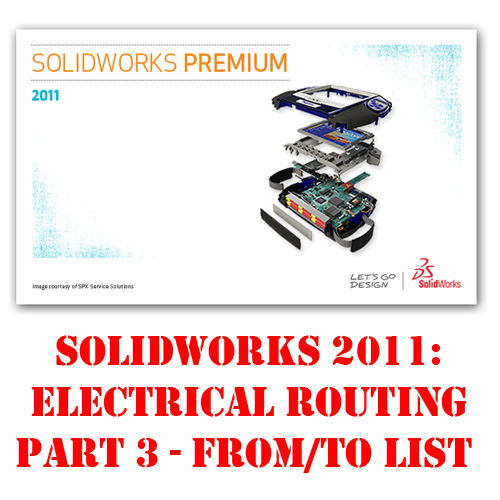 Almost two years ago I posted two videos to the site detailing the use of SolidWorks Electrical Routing. I had full intentions of producing a Part 3 but life as it does sometimes had other plans for me. Finally after several friendly reminders from readers via e-mail and comments on the site, I have released Part 3. Sorry it took so long…but I tried to pack it full of content to make it worth the wait. Part 3 introduces the use of From/To Lists. While they do require a little setup…From/To Lists can drastically reduce the time it takes to model electrical cables in SolidWorks. I was already talking a bit about bandwidth in the first two videos…so this one is going on YouTube. My apologies if it is blocked for you at work, but the bandwidth was getting a little expensive. One REALLY nice thing is that YouTube recently lifted the 15 minute video length restriction. This video goes over that slightly (18 minutes) so that enhancement kept me from having to break it up into two parts. The video is shown below. If you go to the YouTube page you can watch it in HD. I hope you enjoy it. It was nice to dive into the details of Routing again….hopefully I’ll find some time to do some more videos again soon. Just saw the part 3 routing video – lots of info to pack into 18 minutes but it certainly whets the appetite for more. Thanks. Ricky thanks for the great posting .It sounds really solid and well and I like such solid content posts a lot. I like,This I have also seen the program elecworks. The routing does automatically from electrical schematics. I’ll check the Part 1 and 2 too. Im always ecstatic to read this. This is the kind of details that needs to be taught and not the misleading misinformation that’s at the other blogs. I appreciate you sharing this best information. This is a nice content.I like this one.The written skill is so good.This is a well informative post.I appreciate to this content.I am very impressed to this great article.Thanks to share this blog.Keep it up. I was waiting for that PART 3, I was so stupid, that I didnt read your blog earlier, what a shame. Thanks! Didnt know that PART 3 was already out, however many thanks for this great post. I’m waiting for more, thank you! When the part 4 is coming? waiting for. Thanks for the 1,2,3 parts. Are you going to post more? Thanks for the wonderful information. I’m very pleased! Thanks for the instructions. Keep it up! Any news from PART IV ? 3 error(s) found. No data has been imported.I don’t understand this error. I looked for duplicate entries and found none. does anyone have an answer? However it would be helpful to note that some strains of the virus cannot be detected by every day anti-virus programs. Nice! You have already over 4k views on youtube. Thats awesome..
Yeah.. Still waiting for part 4 tho..